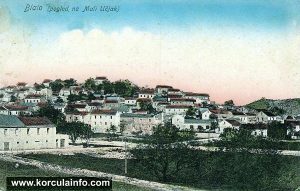 Blato, a town in the interior of the island of Korcula (4-odd km from the coast), 7 km south-east of Vela Luka. It lies on the eastern edge of the Blato field. The economy is based on farming (Mediterranean crops). The chief arable land is the Blato field, which has been dried (water has been taken into the Bristva Cove by a tunnel). Most of it is under vineyards. 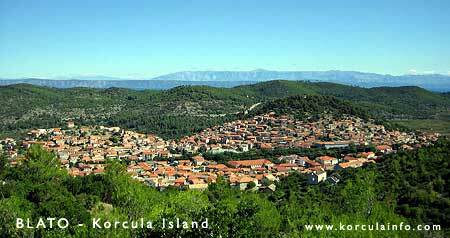 Blato is the economic centre of the island, located on the regional road Korcula – Vela Luka. The most prominent is the Chivalrous Society “Kumpanija” (Companions), established in 1927. The chivalrous game called “kumpanija”, is one of the most interesting traditions in Blato, and regularly takes place on the 28th of April, on St. Vicenza’s Day (patroness of the town), whose bones were relocated to Blato two centuries ago by consent of the Pope Pio VI. Kumpanija is a chivalrous fight between two armies showing their readiness to defend their home, as a memory of distant centuries when the defence of the island was in hands of the island defence unit called “kumpanija” (Companions). Upon consent of the local head, the leader of soldiers, so-called “kapitan” (Captain) starts with the sword dance in several dance figures. An especially interesting part is the role of “alfir” (standard-bearer), dancing with a large flag. After the end of this chivalrous game, the soldiers may dance with girls (dance called “tanac”). Kumpanija is accompanied by belows and a big war drum. The thousand-year-old custom of sacrificing an ox was abandoned several decades ago. The game takes place in front of the church of All Saints, on the so-called “plokata”, in a suggestive ambience, where also other feasts and events are held. Remains of the Junianum estate date back to Roman times. The oldest structures are the graveyard church of the Holy Cross and the church of St. Jerome, built in Romanesque-Gothic styles (14th c.). The mediaeval parish church of All Saints was extended in the 17th century (by stone-masons from Korcula). It features marble altars. At the beginning of the 18th century a classicist chapel of St. Vicenza was built, with the saint’s luxuriant tomb. The altarpieces (All Saints and Madonna with Child), painted on wood, are works by the Renaissance master Girolamo da Santacroce. The old loggia, mentioned as early as the 15th century, was replaced by a new one, made in 1700 by a Korcula stone-mason, Spaso Foretic. The Renaissance-Baroque citadel of the Arneric family houses the Town Museum. Several Baroque mansions of Korcula noblemen are especially interesting within the complexes of folk architecture. In Zablace, west of Blato, is an interesting one-nave church of Sts. Cosmas and Damian from the 12th century. Several small mediaeval churches in the surroundings are mentioned also: St. Mary in Polje (1338), St. Martin in Mala Krtinja (around 1346) and St. Michael in Dugi Pod (1346). 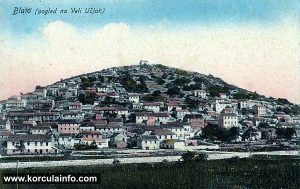 With its harmonious urban whole, Blato aroused the interest of a number of travelogue writers as early as the 18th century. The centre of the town features a nice line of lime-trees, stretching for more than 1 km, providing a unique experience in June when lime-trees are blossoming. The most beautiful view on Blato and its surroundings is offered from the road leading to the southern coast, where many accommodation facilities are located.